When a film crew wakes up a sleepy Georgia town, murder is in fashion.... Sugar Creek is all abuzz. A film is being shot on a historic plantation, and vintage clothing store owner Cookie Chanel is thrilled to provide authentic period outfits for its stars. When Cookie discovers the temperamental leading lady drowned in a pond, wearing a lovely vintage dress, she's suddenly on location for a real-life crime scene. And when a ghost says the dress belongs to her, the number of clues Cookie has to investigate rivals the size of her shoe collection. With the supernatural support of her psychic cat, Cookie must find a killer in the cast of suspects and avoid starring in her own final scene.... Don't miss Cookie Chanel's fashion tips. 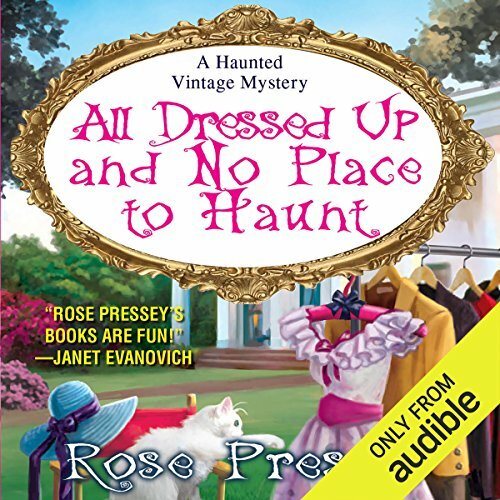 ©2015 Rose Pressey (P)2015 Audible, Inc. This is a mediocre story with silly characters. I probably won't get the next book.